Beneath Seattle’s older houses and apartment buildings, broken side sewers are a festering problem that can cost many thousands of dollars to repair and can complicate or even derail a home sale. Just before the holidays last year, raw sewage was spotted streaming down a Queen Anne public stairway after a joint failed in a sewer pipe snaking from a seven-unit apartment house built in 1909. With every toilet flush, the exposed pipe ejected fresh sewage onto the hillside and soiled the public stairway at 11th Avenue West and Gilman Drive West. A Seattle Public Utilities crew responded, but unlike other cities, in Seattle it’s ultimately the owners’ responsibility to maintain these “side sewer” pipes even under the sidewalk or street, all the way to the connection with the city main sewer. 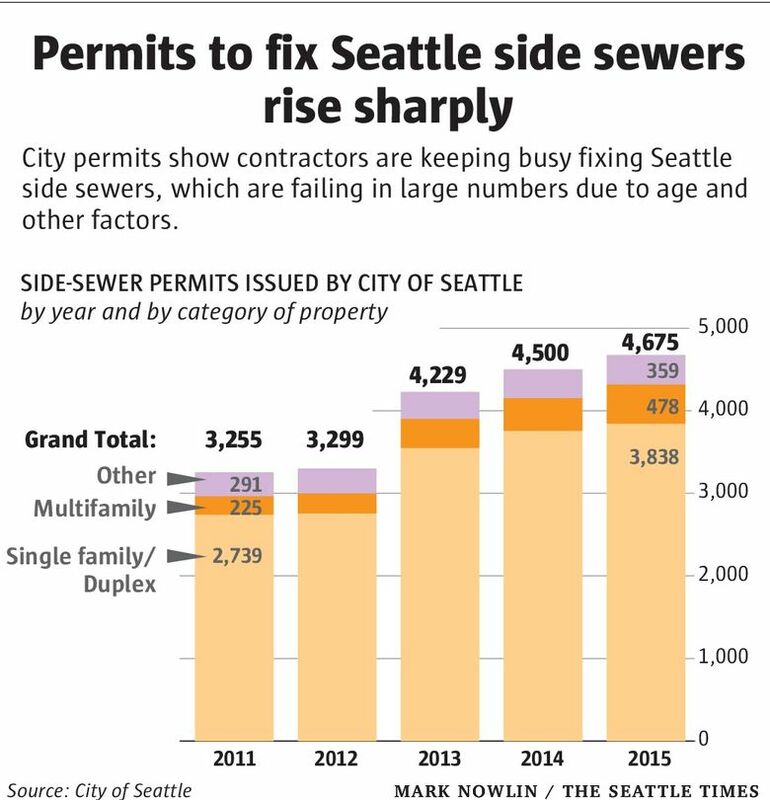 Side-sewer contractors registered with the city are busier than ever digging up the earth around Seattle’s old homes. A side sewer carries wastewater from a building’s sinks, toilets and drains to the public sewer main. What can go wrong with it? A failure in the side sewer can cause raw sewage to back up into the home, give rats room to invade and create a sinkhole. The city of Seattle has a lookup tool that allows anyone to see a property’s side-sewer map and “card,” a log of repairs. Who can fix my side sewer? Contractors must be registered to do side-sewer excavations in the public right of way in Seattle. The city maintains a list. The City of Seattle provides loans to low- to moderate-income households to make critical home repairs, including sewer lines. 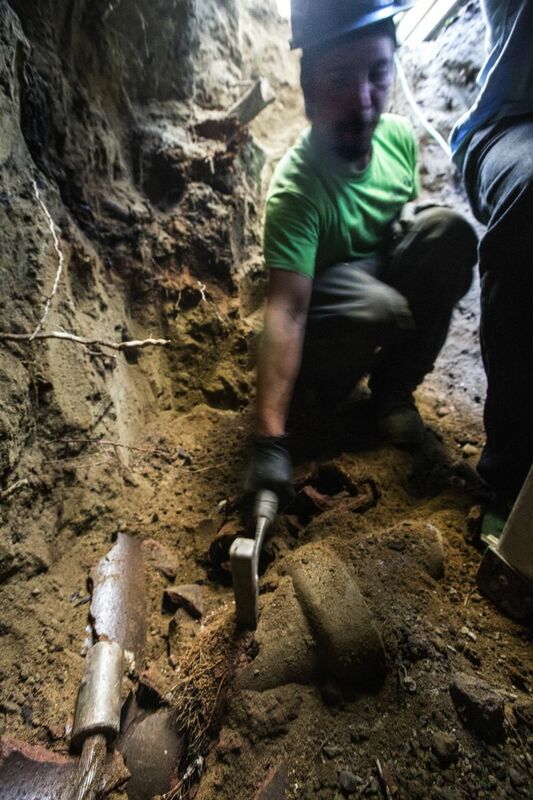 Beneath Seattle’s older homes and apartment buildings, side sewers are a festering problem. City records show a steady increase in the number of permits for repairing or installing new side sewers: from 3,255 in 2011 to 4,675 last year. 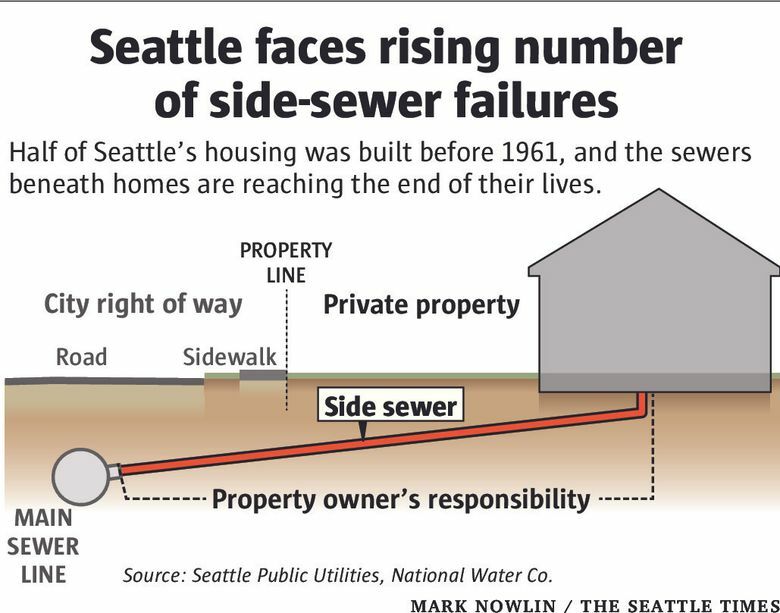 Because these pipes can cost many thousands of dollars to repair and can zigzag across properties with different owners, side sewers are a growing headache for Seattle’s housing market. While some owners fix their side sewers after discovering a sewage spill, often the issue only surfaces in the course of buying or selling a home. Across Seattle, the risk of breaks in side sewers is high primarily because of their age: About half of Seattle’s housing was built before 1961, according to the Census Bureau. Tree roots and soil conditions also pose potential threats. Owners of newer homes shouldn’t be lulled into complacency, though. “Just because the structure looks brand-new, it doesn’t mean anything unless the buyer knows what was done with the sewer connection,” Krigsman said. Even newer pipes can be compromised. The side sewer from the Queen Anne house was made of PVC, not older materials like concrete or clay, said Kevin Flynn, utility manager at Raymark Plumbing & Sewer, which repaired the pipe. 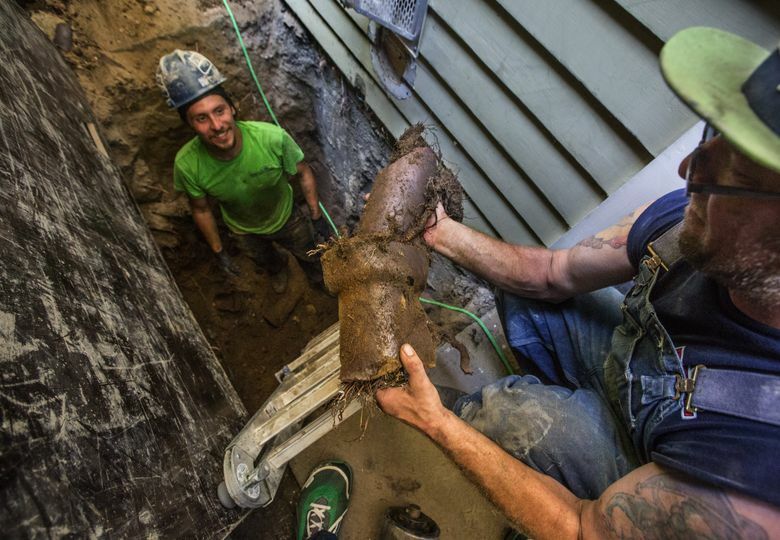 Once a sewer pipe is breached, the risks multiply: Roots and soil can form a backup-causing clog, rats can invade houses through toilets and, worst of all, a sinkhole can form and jeopardize lives. “I’ve seen a truck fall headfirst in Queen Anne into one of those holes,” Flynn said. Repairing breaks can be treacherous too, especially if the soil conditions are poor. Last month, a worker died during a side-sewer repair in West Seattle when a trench he was digging caved in on him. It was the state’s first fatal trench collapse since 2008. Neglect of side sewers on properties ends up costing the city’s utility time and money too. According to Seattle Public Utilities, most of the calls it receives during the winter for sewer backups during a storm are traced back to a side sewer. In the case of the Queen Anne sewer spill, a city crew traced the leak back to the apartment house, cleaned the stairs and dug a trench to divert the stream of sewage to a manhole. The city notified the apartment owner, who paid Raymark to repair the break. But unlike a roof, a side sewer is literally out of sight, out of mind — and appraisers don’t generally give homeowners much, if any, credit for replacing them. 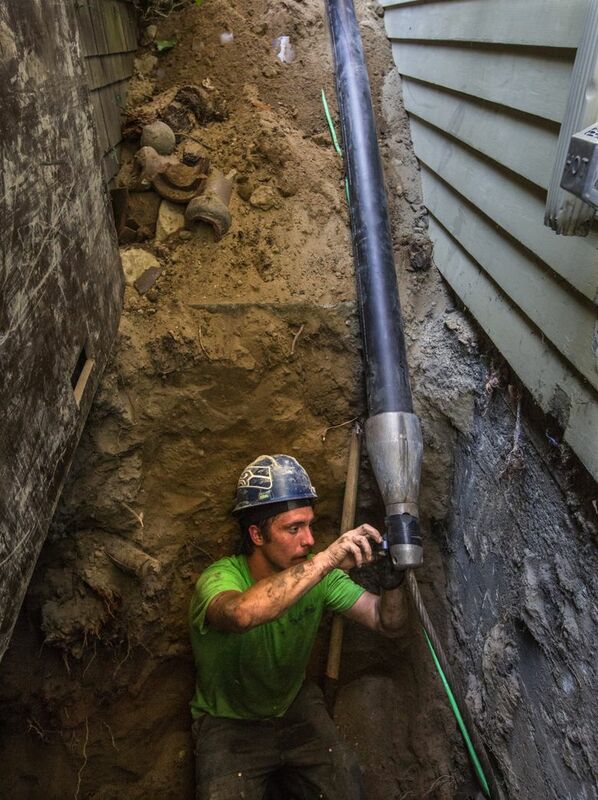 Seattle homeowners are vulnerable in more ways than one: Unlike other cities, Seattle holds property owners responsible for the side-sewer pipe from their home all the way to the “wye,” or the lateral connection to the city main. If there’s a break in the pipe between the owner’s property line and the wye, the owner is on the hook to repair it, including the cost of digging up and resealing the city street or sidewalk. “Owners feel it’s unfair, but that’s how it’s set up in the city of Seattle, unlike other municipalities,” said Krigsman, the Windermere agent. That can be an expensive proposition, especially because pipes tend to be buried deeper as they approach the sewer main. Crittenden said her rule of thumb is to budget $10,000 for a side-sewer repair, but it could be as high as $40,000. Tim Walsh, owner of Seattle Pipeworks, said one of the most severe cases he’s seen was a Seattle home near Lake Washington that had just been sold. The new owners had only done an inspection of the first 200 feet of the 600-foot-long side-sewer pipe, because “nobody has a 600-foot scope,” Walsh said. After they bought the home, a leak was discovered farther downstream. “The line had never been maintained,” Walsh said, and so the cost of repair quickly climbed to $35,000 and required cooperation from other property owners. Raymark’s Flynn said the most expensive job his company has ever done cost a homeowner on Beacon Hill more than $70,000. The sewer pipe was 23 feet underground and soil conditions were difficult. Homeowner’s insurance typically covers only the pipes inside a house and under a house, but not the section of pipe between the property line and the city main, said Charles Romo, a spokesman for National Water Co., a Moses Lake firm that insures about 16,000 properties in the state. About a year ago, Greg Avedesian and his wife spotted their “forever” house in Magnolia. They’d lived in Seattle long enough to know they needed to order a sewer scope as a precaution, in addition to the routine home inspection. Then he got the worst-case call. “They found a big crack in it,” Avedesian recalled. So much sewage had saturated the soil at the crack in the pipe — 9 feet below ground, not far from the city main — that the line had sunk another 6 inches. Avedesian, who expected to make upgrades to the 1942 home, said he knew he couldn’t ignore the sewer leak. Flynn, who evaluated the situation, agrees side-sewer failures create a welcome mat for rats. “Sewers are vermin’s freeway. That’s how they get around town,” he said. And to complicate matters, the break also affected a neighboring home because it was downstream from where their side sewers joined up. Eventually, Avedesian and the neighbor agreed to split the cost of fixing the break. Avedesian said he shelled out $13,700 to replace the sewer line from his house up to the break, and the neighbor contributed $4,000 toward repairing the break. While sellers are required to disclose known problems with their side sewer, there’s no rule against being ignorant. Blair Paul, a Windermere agent, disagrees. Paul encourages all sellers to scope their sewer and make the report available to buyers, partly as a way to discourage multiple buyers from tampering with the sewer line for video inspections. Ard, the Windermere agent, listed a home for just over $1 million in Magnolia last year. A Los Angeles couple interested in buying the house did a sewer scope at the urging of their agent and found problems that ultimately would cost $15,000 to remedy. The seller refused to pay the full cost to fix it, Ard said. To get the deal done, the brokers each chipped in $3,500, the buyer paid $3,500 and the seller paid the rest.